Pooja purchased a house 3 years ago, for which she availed a loan of 40 lakhs, at an interest rate of 11.25% for a tenure of 15 years. She recently found out that the banks are offering home loans at reduced interest rates to 10.50%, for example. When she became aware of this, she decided to check if the reduced interest rates apply to existing borrowers. Fortunately for her, her bank’s representative explained her how refinancing works and provided with all the necessary assistance. She now pays a much lesser EMI per month on her home mortgage and is pretty much satisfied with the potential savings. The interest rates came down after the Reserve bank of India introduced the MCLR (marginal cost based lending rate) method, effective April 2016. This method replaced the base rate method that was used previously by banks for setting their lending rates. The MCLR was introduced to enable a faster transmission of rate cuts to bank customers. Additionally, following demonetisation, Prime Minister announced big interest subventions for home loans of up to R12 lakh earlier this year and urged banks to keep the poor and middle class at the focus of their activities. Following this, many banks cut their benchmark lending rates by up to 0.7%. However, those who availed loans during the base rate regime are stuck with the base rate and pay higher interest, while new customers are taking advantage of the new lower rates. RBI’s stand is neutral now, and there is possibility that the rates may come down further after a year. So, the time is now to make the switch to MCLR. Pooja’s case was not the first and certainly not the last because people refinance their mortgage citing various reasons; lower interest rate being the most popular one. However, there are many people who don’t fully pay attention to their banks’ procedures and the fine print, or don’t manage their finances as efficiently as others and miss out on the benefits of MCLR. For that reason alone, discussing about refinancing home loan is important. While there certainly are benefits, one needs to careful before refinancing their mortgage because overlooking the fine print can have a negative impact. Before getting into the details of refinancing, readers should clearly understand how refinancing of mortgage works in India. Refinancing mortgage is taking a fresh loan to pay out the existing loan. There are two different scenarios in this. The first one is when you continue with the same bank or financial institute. The second scenario is when you decide to change banks due to poor service of your current bank or if another bank provides incremental funding. 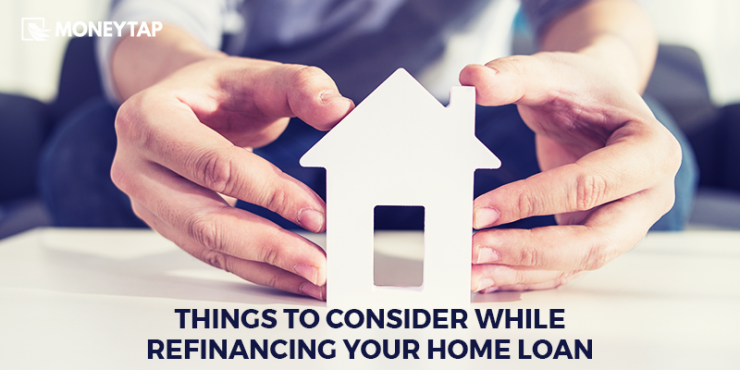 In either case, there are certain essentials that you need to consider before choosing to refinance. Reap the benefits of revised or lowered interest rates. The choice to reduce the tenure. Reduce EMI by increasing tenure. Switch from floating interest rate to fixed interest rate, or vice-versa. The interest rate is equated monthly. For instance, it the loan is given at 11.25% pa, the monthly interest rate in the above equation will be 11.25% ÷ 12. ‘N’ is the total tenure of the loan (number of months). As we can see in both the cases, there is a significant difference in the savings on the total interest a customer pays. The above examples prove why the timing of refinancing decision plays a crucial role. However, there are other factors that influence the decision too. So, let’s dive a little deeper. You can refinance your loan to increase the EMI, which will reduce the loan tenure. However, you need to careful because if your EMI outflow exceeds 50% of your income, you may find it difficult to manage your monthly expenses.Conversely, if you opt for a longer tenure, your EMI will be comparatively lower. This could ensure a smooth functioning of your expenditures. Having said that, you should also be mindful about the type of interest. Always choose the refinancing product and the lender that best suits your needs. This is because every individual deal has its own parameters. Every financial institution has its own version of “customer service.” For this reason, ensure you have read and understood the fine print. Rates can fluctuate and it takes nearly 45 days for your refinance deal to close. Thus, making it important for you to find out about lock-in rates and float-down provisions. Be realistic regarding the value of your home because when you opt for incremental funding, the new bank will require the exact value of your home. Unless the bank knows the exact value of your home, it won’t be able to calculate your eligibility, which can dampen the process. If their surveyor finds out in his mandatory survey that the value has been wrongly quoted, you may lose the opportunity to file your applications elsewhere too. Just because you have been banking with your current lender for a few years now, don’t assume you will be given special privileges. This highlights the need for you to do your survey and compare various interest schemes and loan programs. Have all your documents in order and aligned according to the checklist that the bank provides. This will reduce the processing time to a great extent and will ensure that you are able to finish what you have started. Above all, make sure you have a verified credit report. Credit bureaus like CIBIL, High Mark Credit Information Services, Experian and Equifax have all your previous credit data assigned to your PAN. Any default might have a negative impact on your credit score, so ensure that you don’t default any EMIs or credit card payments. In case you have a poor credit score, your chances of getting a refinance will be less. Besides this, any other existing loan or a recent loan application for purchase of a vehicle or a credit card will also have a negative impact on your credit score. Whatever may be the case, it is good to know your score before heading out to refinance your loan. Owning a house is a bliss and clearing off the mortgage is even more blissful. However, until you are able to pay off your mortgage, you will need to plan your EMI payments diligently. Refinancing mortgage can be beneficial if done right but doing so in haste can leave you in a more desperate situation than before. Hence, understand all the requirements as mentioned above and ensure you have fulfilled them before you begin the process. Read more on loans and other financial topics at MoneyTap – Your Personal Line of Credit.